The Green party may not emerge from the general election with more representation in parliament but it is on course to win its highest-ever vote – and it will be Labour and the Liberal Democrats who feel its impact the most. This article was originally published by the Policy Network Observatory. 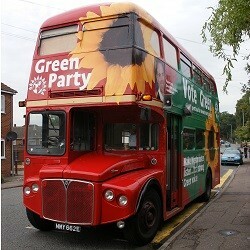 A recent beneficiary – and cause – of the ongoing fragmentation of the British party system has been the Green party. Founded originally in 1972 as the People party, the Greens have since 1990 formally been three discrete, but fraternal, parties: the Green party of England & Wales, the Green party of Northern Ireland, and the Scottish Greens. The most striking electoral achievement of their early years was to win 15 per cent of the UK-wide vote in the 1989 European parliamentary election (although this earned them no representation in the European parliament, given the operation of the first-past-the-post electoral system at that time). The Greens have never again won such a high proportion of the vote across the UK, but have maintained a stable level of support, gaining around 6-8 per cent of the popular vote at European elections since 1999 (the first held under list-PR in the UK), and two or three MEPs. Last year, saw them poll 7.9 per cent and win three MEPs. Under first-past-the-post, they have fared less strongly in general elections, typically recording around one per cent of the UK-wide vote (although a slightly higher average in the seats they contest); in 2010, the Greens won 0.96 per cent of the vote (1.81 per cent in the seats where they put up a candidate), and returned an MP to the House of Commons for the first time, as Caroline Lucas wrested Brighton Pavilion from Labour. In addition, the party has two seats on the Greater London Assembly, numerous local councillors across the country, and won control of Brighton & Hove unitary authority in 2011. In the run-up to the 2015 general election opinion polls are consistently placing Green support in a range between 4-11 per cent, and the party is currently averaging approximately six per cent. This suggests that the party might achieve the kind of levels of popular support it normally only wins in European elections, even without the benefit of a PR electoral system. However, it is unlikely that more Green MPs will be returned to the Commons, for, despite concentrations of relative strength in a few seats such as Norwich South, the only real prospect of victory remains Lucas in Brighton Pavilion. Even so, things have rarely been so encouraging for the party in terms of national support. The Greens have enjoyed a remarkable surge in membership recruitment since last year. This seems to have been sparked by the row about whether the party’s leader, Natalie Bennett, should be allowed to take part in a televised leaders’ debate in the election campaign; following initial proposals (later withdrawn) by the broadcasters which would have included the United Kingdom Independence party’s Nigel Farage but excluded Bennett, a rush of sympathisers flocked to join the Greens. In 2013 Green membership remained at a broadly stable level of 13,809, but by the end of 2014 it had risen to 30,809, before surging rapidly to 50,000 by February 2015.
Who are supporting the Greens then? New British Election Study data gathered at approximately the same time that the Green membership surge started in the autumn of 2014 includes a decent sample of more than 1,000 voters claiming that they intend to support the Greens in the forthcoming general election. This reveals various interesting things: Green sympathisers are generally more likely to be female (57 per cent); younger (average age 41, with 31 per cent under 25); and non-religious (48 per cent) than the supporters of other parties. They are also more likely to be graduates (47 per cent), Guardian readers (28 per cent), and only the Conservatives are more likely to have supporters who see themselves as middle class. The party’s leftist, post-material and socially liberal stance is well-known, and emphasises policies such as opposition to economic austerity and to PFIs to fund public services; higher marginal rates of income tax for the wealthy; a ‘living wage’ for all; and the replacement of VAT with ‘eco-taxes’ such as aviation fuel tax. The party also advocates the substitution of council tax by a land-value tax; extra funding for the NHS and public transport; the scrapping of road-building schemes; massive investment in renewable energy; a radical reduction in carbon dioxide emissions; and opposition to GM crop initiatives and fracking. Such a programme is most likely to attract those who see themselves as leftist, and who are defectors from Labour or the Liberal Democrats. BES data confirms the leftist orientation of Green supporters: on a left-right scale running from 0 (far left) to 10 (far right), they place themselves at 2.76 on average – the furthest left of any party. Moreover, analysis of voting behaviour during the 2014 European election shows that 21 per cent of Green voters had supported Liberal Democrat candidates in the 2010 general election; 18 per cent had voted Labour; and a further 18 per cent had have voted Green. Some 30 per cent did not vote at all in 2010, and only 12 per cent voted for other parties, approximately half of whom were Conservative supporters. In short, the recent advance of the Greens, albeit less spectacular than that of the Scottish National party and Ukip, has almost certainly had the most impact on Labour and the Liberal Democrats. Green supporters share with those of Ukip a certain populist disillusionment with the political mainstream (for example, three-quarters agree with the statement that “politicians don’t care what people like me think”), but there is a crucial difference: they are much more likely to have a sense of political efficacy than Ukip’s followers. Beyond this, they, of course, hold substantially different views about a range of issues including immigration, Europe, British identity, austerity, welfare benefits, crime, gay marriage and the environment; they are essentially cosmopolitan leftist social liberals rather than nationalist, right-wing, social conservatives. But they are also more optimistic about the potential for positive outcomes from political participation. Thus, 49 per cent of Green supporters reject the view that “it is difficult to understand what happens in government and politics” compared to 35 per cent of Ukip supporters, while 35 per cent of Greens disagree that “politics takes too much time and effort” compared to 17 per cent of Ukip sympathisers. This perhaps bodes well for the future of the Greens: though still a minority taste in British society (as elsewhere), Green supporters are exceptionally committed to active participation in politics, which should provide more bang for the party’s campaign buck during the election – and after. Of course, what voters say to opinion pollsters is one thing and what they do at the polling station is another, but it is interesting to note two things. First, Green opinion poll support is significantly higher now than it was at a comparable moment prior to the 2010 general election. Second, Green support in the polls prior to last year’s European election held up well on the day: in January 2014, the Greens were polling five per cent and in the actual election in May they scored 7 per cent. In short, the Green party is on course to return its highest-ever vote at a UK general election, and will most probably do so largely at the expense of Labour and the Liberal Democrats, as it draws a relatively young, educated and politically engaged left-liberal constituency away from these mainstream parties.